Works out £4 a month. Heat for doing the arithmetic for us. 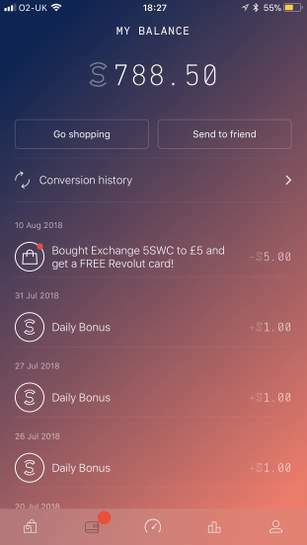 You accrue coins each day by simply walking and every month you can …You accrue coins each day by simply walking and every month you can convert 5 sweatcoins for a Now tv code. You accrue coins each day by simply letting the app spy on you and sell your info to faceless corporations. I’ve had NowTV movies since April this year and not paid for it yet. Not sure if you guys are aware but there’s an app called sweatcoin, completely free. You accrue coins each day by simply walking and every month you can convert 5 sweatcoins for a Now tv code. The Now tv offer usually comes around the 20-25th of each month and has always worked for me, they even had an entertainment offer on once too. I have Now TV but I doubt if I'd watch 12 movies in a year so not for me, …I have Now TV but I doubt if I'd watch 12 movies in a year so not for me, I'll keep my 48 quid in my pocket to spend on something else.Each to their own, but it seems to me that some today don't get up off their asses in a year!Bet some down a couple litres of coke and popcorn at each viewing too. The main reason I rarely ever go to the cinema anymore too.No wonder we have an obesity problem. I bought the NowTV combo movies and entertainment pass at Christmas time …I bought the NowTV combo movies and entertainment pass at Christmas time for about £99, can I therefore buy this and will it start up once my movie pass ends at Christmas ?? I’ve registered with Now Tv and added my payment details as required but it’s now shown that I’m on a one month free deal and will go onto the normal £9.99 a month from the 13th Sept?? Any ideas how I’ve went wrong and can’t get this deal? 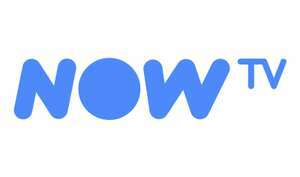 I’ve registered with Now Tv and added my payment details as required but i …I’ve registered with Now Tv and added my payment details as required but it’s now shown that I’m on a one month free deal and will go onto the normal £9.99 a month from the 13th Sept?? Any ideas how I’ve went wrong and can’t get this deal? In the same browser you're logged into NowTV, try clicking on the 'Get deal' link in this thread now. Not really worth £4pm, imo, when it's in 720p and it's only movies (no …Not really worth £4pm, imo, when it's in 720p and it's only movies (no series etc). On a 55" TV or larger, the picture just looks pretty poor if you're used to 4K / Full HD on Amazon Prime TV / Netflix (this coming from a casual viewer, not a picture sn. Obviously those services are more expensive, but I'm sure a lot of people can't enjoy otherwise good NowTV content as much because of the low resolution. When I stream films on NowTV (not the 'Live' ones), it's perfectly pin-sharp on my 55" 4K OLED TV - & I am a bit fussy about these things / can easily tell the difference. How did you get now tv for £4 a month? Oh perfect, I have done the 12 month deal when the deal is up I will do that. Thank you. Oh perfect, I have done the 12 month deal when the deal is up I will do …Oh perfect, I have done the 12 month deal when the deal is up I will do that. Thank you. Ideal time for me. The reduced rate for my cinema pass ends next month. Back to £4 per month for a year. Tried it myself, says I'm not eligible for the offer. Doesn't mention …Tried it myself, says I'm not eligible for the offer. Doesn't mention having any current offers.I tried the live chat and was told there was no such offer. Then when I pointed out other customers were getting it I was told it's a special offer that is combined with broadband. As I already have a broadband offer on my account I didn't want them mucking around with it so told them to leave it be.Not sure how much truth there was to what I was told. I don’t have B.B. with them and got the offer. I did cancel my current cinema pass which runs out in 2 weeks first before trying though. Not worth it. Choice is utter mince. Great, thanks. It offered the deal to me on log in. Are they offering 1080p or god forbid 4K yet? Still 720p at the moment but 1080p is supposed to be coming this year. Sky offer very few movies in 4K for their Sky Q customers who will be paying a fortune each month. Sky are competing against themselves to some extent with NowTV so it is understandable that they'd want to give a better service for those paying a lot more for Sky whereas NowTV allows them to give a reduced quality service for a low price so they can still earn money from people who are unable or unwilling to pay for Sky. I’m pretty sure it did that for me before, I went into my purchase and clicked the “claimed” button. If you don’t it stays open and they just say you can’t claim more than one but if you mark your previous as claimed your able too. Great find and ordered. Thanks! When I stream films on NowTV (not the 'Live' ones), it's perfectly …When I stream films on NowTV (not the 'Live' ones), it's perfectly pin-sharp on my 55" 4K OLED TV - & I am a bit fussy about these things / can easily tell the difference. Not too fussy if you are watching a 720p stream on a 55" 4K screen! The difference between 720p, 1080p and 4K streams is obvious on a screen of that size. This is from an article in January, so hopefully 1080p streams should be here soon. Great deal though OP, heat added! How much is in 4k? I’m pretty sure it did that for me before, I went into my purchase and c …I’m pretty sure it did that for me before, I went into my purchase and clicked the “claimed” button. If you don’t it stays open and they just say you can’t claim more than one but if you mark your previous as claimed your able too. I have an S8, must be differently designed, I can't find anything like that ? This offer came up as an offer for downloads then it restarted my monthly pass up for £9.99 a month without me asking. So what actually was the £48 for is to download movies to to phone and tablets or is it the streaming service. I am confused I don't download movies just stream them on my Nowtv stick. Feel conned if it's just for downloads and why would it restart my pass at £9.99 a month without me asking says I will be charged £9.99 on August 24th. What have I bought for £48 ? This offer came up as an offer for downloads then it restarted my monthly …This offer came up as an offer for downloads then it restarted my monthly pass up for £9.99 a month without me asking. So what actually was the £48 for is to download movies to to phone and tablets or is it the streaming service. I am confused I don't download movies just stream them on my Nowtv stick. Feel conned if it's just for downloads and why would it restart my pass at £9.99 a month without me asking says I will be charged £9.99 on August 24th. What have I bought for £48 ? If it was sports, I would take it now.